in which, according to the established tradition, NordVent acted as a Sponsor. Nordvent has traditionally participated in International Data Center Design & Engineering conference which took place in Moscow, in the Digital October center on April 27, 2016. We were glad see you on our stand and hope to meet you on the next Event! 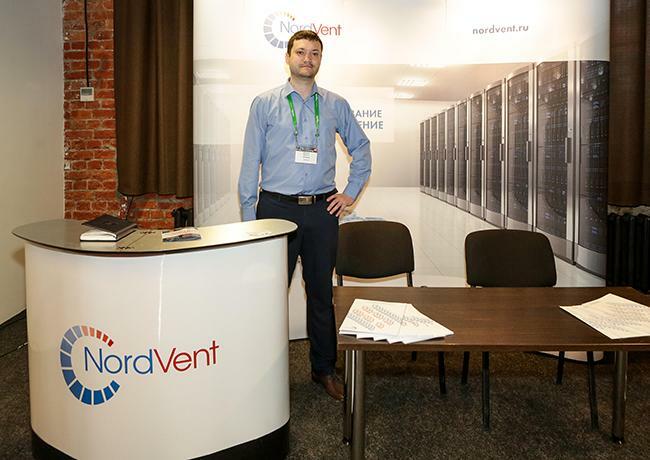 NordVent, as the Silver Sponsor, has attended in the 10th anniversary conference "Data Center 2015"
which took place on the 15th of September in Moscow, in the Digital October Center. ACHEMA 2015, 15-19 June - Frankfurt am Main, Germany, was one of the most visited in the last editions; NordVent Swiss Tech SA has confirmed his presence on the international market of cleanrooms, gathering promising contacts from companies eager to establish an alliance for their future projects. The exhibition has been as well a good platform to consolidate contacts with exisiting clients, agents and meet partner companies to wide the spectrum of services and products in the immediate future. Thanks to everybody who visited our booth! See you at the next event! On the 23d of April Nordvent has attended in International Conference Data Center Design & Engineering in Moscow as Silver Sponsor. With assistance of the German Ministry of Economics, Nordvent Luftungstechnik GmbH participated in Aqua-Therm Exhibition in Moscow 03-06 of February 2015. Aqua-Therm is the leading one in its sphere in Russia. Industry professionals rate Aqua-Therm Moscow as the best event for new technologies and products in the HVAC industry. Nordvent Swiss Tech SA has participated at CphI Worldwide in Paris 7- 9 of October 2014 at Exhibition Centre Paris Nord Villepinte. This unique event has attracted participants from all over the world, industry professionals as well as technicians and commercial deputies have been visiting the Stand establishing new relationship for future new business relationship. Nordvent Group participated in Chillventa exhibition in Nurnberg from 14 till 16 of October 2014. Moscow NordVent office attended the ninth international conference "DC-2014". The event took place on September 4-5 in «DigitralOctober» Moscow center. "DC-2014" сonference was devoted to the design, construction and data center services.